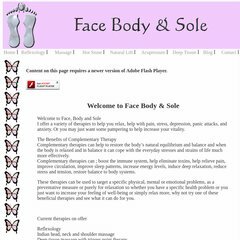 Topics: Reflexology, Indianhead, Hot Stone, Natural Lift, Acupressure, and Deep Tissue. It is written for PleskLin language. There are 3 Nameservers, ns1.globalgold.co.uk, ns2.globalgold.co.uk, and ns3.globalgold.co.uk. It is hosted by Global Gold Network Ltd (England, Harlow,) using Apache/2 web server. PING www. (91.199.151.86) 56(84) bytes of data.